BERLIN – After three straight wins, Worcester Prep’s boys’ varsity la-crosse team took its lumps against Parkside, falling to the Rams at home on Monday, 11-1. 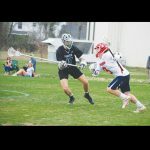 The Mallards opened the season with a win over Saints Peter and Paul, but dropped the next two to Decatur and Cape Henlopen. 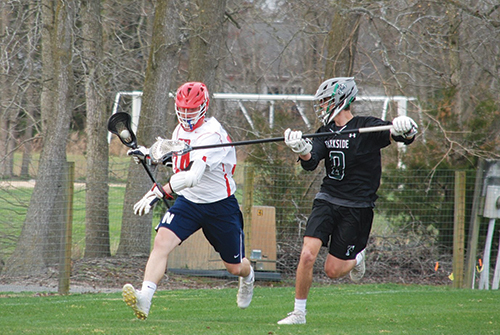 After that 1-2 start, Worcester reel-ed off three straight including a 10-7 win over Bennett, a 16-2 win over MOT Charter last Wednesday and an 8-6 win over Caesar Rodney last Friday. Against Caesar Rodney, Worcester got two goals each from John Arrington and Mason Brown. The Mallards got single goals from Alec Dembeck, J.P. Issel, Dakin Moore and Owen Tunis. Goalkeeper Hunter Gentry re-corded eight saves on 14 shots by Caesar Rodney. Worcester Prep’s John Arrington works from behind against the Rams during Monday’s 11-1 loss. On Monday, the Mallards looked to keep the momentum from three straight wins going at home against Parkside, but ran into a buzz saw. The Rams led 4-0 at the half and steadily built on the lead through the third quarter, which ended 8-0. Worcester finally got on the board with just over four minutes left in the fourth on a goal by Moore, but the Rams closed out the Mallards, 11-1. Next up are a couple of home games against Delmarva Christian on Friday and Delmar on Monday.